The turtle theme was the most popular suggestion, but I think I can add a bit of caramel and nuts for a true turtle experience. Hint hint. 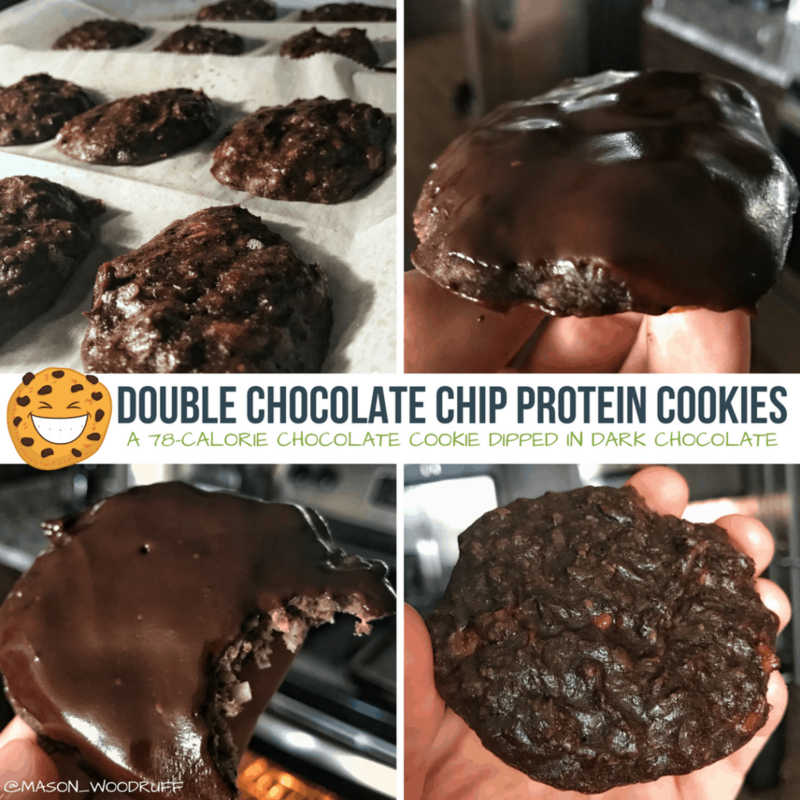 Okay, these double chocolate chip protein cookies have plenty of flexibility to meet your calorie and macronutrient needs. They range from 120 calories per cookie to as low as 78 calories per cookie depending on your needs and how chocolatey you want them to be. 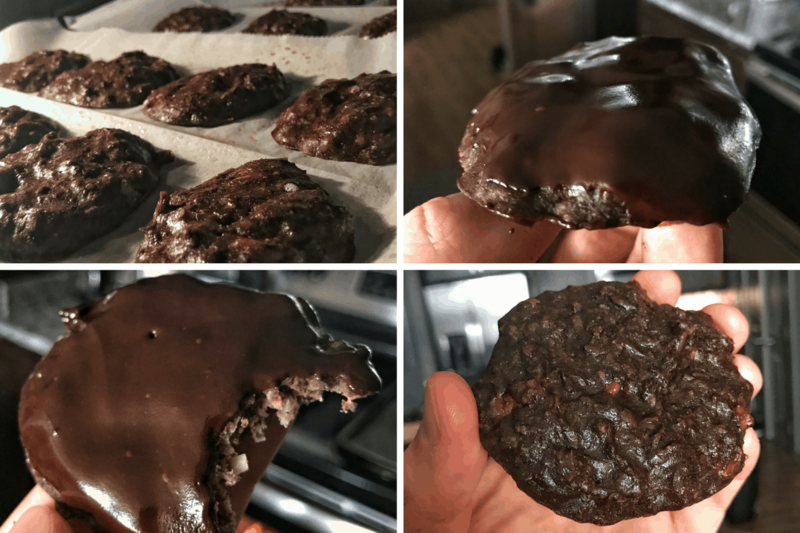 If you’ve tried my High Protein Christmas Cookies, this recipe may look familiar. I love the flavor and simplicity of the Christmas cookies and wanted to replicate it with a chocolate spin. Also, I love that these cookies are flourless. Not because I’m anti-grain or anti-flour but because flours are super-duper concentrated sources of calories. Meaning, you can eat a few hundred calories of flour in seconds without feeling full or satisfied. That’s not the case with the Christmas cookies and now Double Chocolate Protein Cookies, which are filling and nutrient-packed. P.S. Get a food scale. It’ll make your life a lot easier. This is the ultra-super-duper-elite ($9) scale I use. For the chocolate dip or coating, I toyed with several combinations with hopes of making a high protein option. But to be honest, the plain and simple dark chocolate chips and almond milk work and taste the best. If you’re okay with having slightly higher calories and carbs, go with this option. You can use any protein you’d like, but I recommend Optimum Nutrition Gold Standard Whey and/or Dymatize’s Whey or Elite XT blended protein. 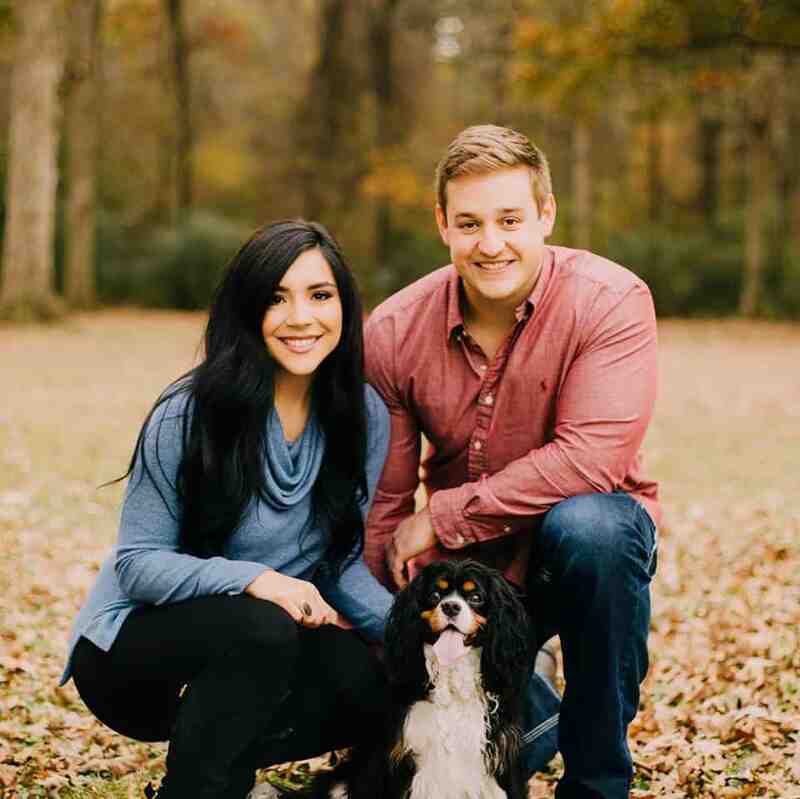 They’re reputable brands that have been around forever. The macros are with Gold Standard Whey. 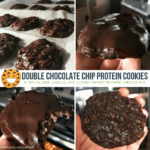 Two ways to make double chocolate cookies that are high in protein and low in calories. Preheat oven to 350 degrees F and line a large baking sheet with parchment paper. Peel bananas and mash with a fork or spoon before adding coconut flakes, cocoa powder, chocolate chips, and protein powder. Mix until smooth. Spoon (roughly 2 Tbsp) mixture onto baking sheet in 15 small circles. (3 rows of 5 cookies) Leave enough space between for some expansion during bake time. If you need to use two baking sheets to spread them out, that's fine. While cookies are in the oven, add remaining dark chocolate chips and almond milk to a small bowl. Microwave, stirring every 20-30 seconds until the chocolate chips are melted completely. After cookies have cooled, dip them face down into the chocolate mixture and set back on the parchment paper or cooling rack. 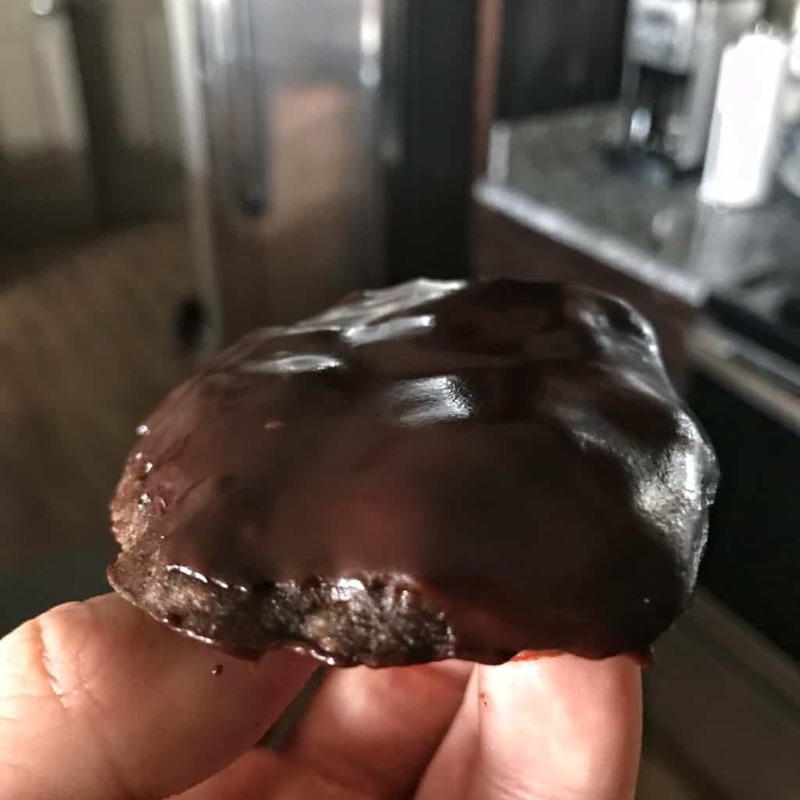 After you've dipped all cookies, you can add remaining chocolate coating with a spoon before placing the cookies in the refrigerator or freezer for 5-10 minutes if your chocolate coating is slow to harden. And that’s it! I hope you enjoy. If you try this recipe — or any recipe on my site — tag me in your creation on Instagram. I’ll be sure to share it with everyone. 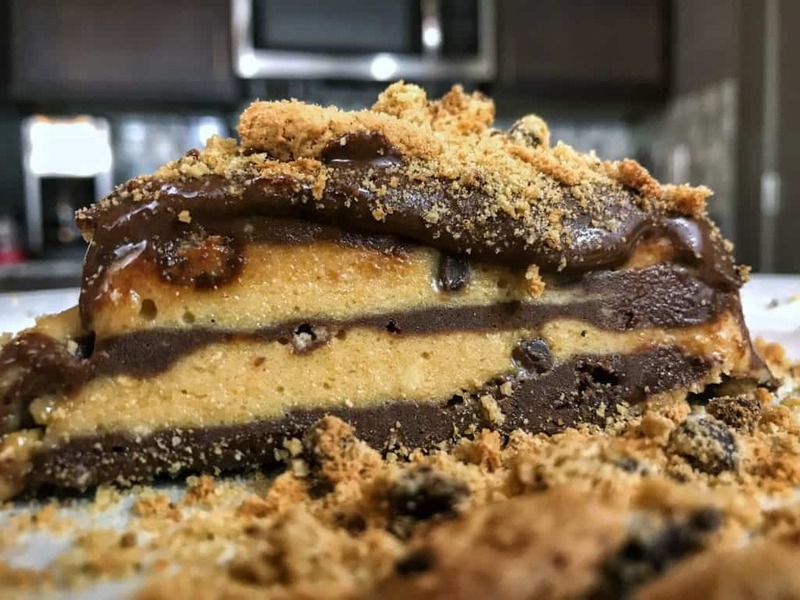 I’d highly recommend my No Bake Protein Cookie Dough Cake (pictured above). One last thing before you go. I think it’s safe to say if you’re here for this recipe, you love chocolate. 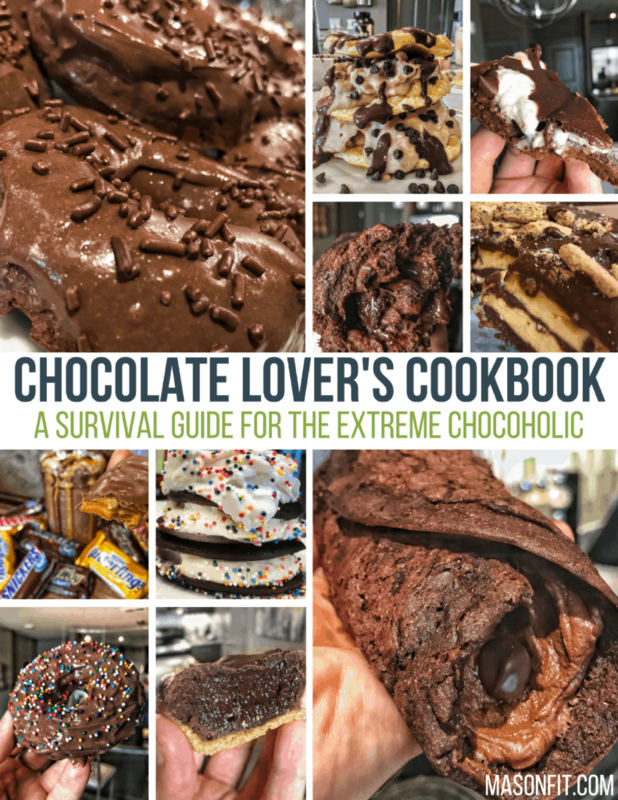 Of course you do, and that’s why I put together a free cookbook just for chocolate lovers. You can learn more about it here or enter your info below to download it for free.